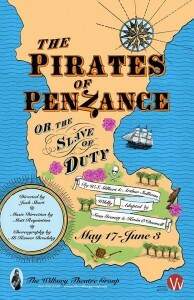 When Gilbert and Sullivan first put pen to paper on Pirates of Penzance over 100 years ago, they probably were not picturing a troupe of actors in Hawaiian shirts and colorful stockings, hitting beach balls around and jamming out to Taylor Swift, or an audience perched upon set pieces wearing leis and waving pirate flags. But considering that in their time Gilbert and Sullivan were the kings of flipping conventions on their heads, they probably would be delighted with this new imagining of their beloved work, adapted by Sean Graney and Kevin O’Donnell, which has seen runs in Chicago, Pasadena and now at the Wilbury Theatre Group in Providence. Forget everything you know about going to the theater, because in this production, all of the rules are different. Other than a few rows of seats for those with mobility impairments, there is no traditional seating. Rather, audience members sit promenade-style on different parts of the set. When a performer needs an occupied spot, the audience member in question must get up and find a different seat. Audience members are also encouraged to keep their phones out and take pictures during the show. 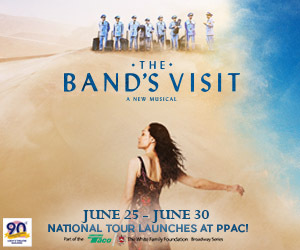 Before the show, as the audience gets accustomed to this weird, nontraditional space they’ve just stepped into, the cast is having a jam session with a variety of music from “Twist and Shout” to “Shake It Off,” while hitting around beach balls and encouraging audience members to sing along. This is not your mother’s Pirates of Penzance. In only 80 minutes, the 12-person cast relays the story of Frederik (Brian Kozak), an apprentice to a ragtag team of pirates (Richie Whitehead, Aaron Blanck, Brien Lang and Jeff Hodge) through a clerical error made by his nursery maid Ruth (Shannon Hartman). As of his 21st birthday, his is free of his indentures and aims to reassimilate into society, find a fair young maiden to marry and punish the pirates for their misdeeds – such is his sense of duty (every time this phrase is used, the pirates must strike a dramatic pose and repeat it, even in the middle of a song). Conveniently for the second of these, a bevy of young maidens, who happen to be the major general’s daughters (Jennifer Mischley, Sherry Romanzi, Emma Sachetti, Sarah Leach and Maggie Papa), enters the scene – singing Kelis’ “Milkshake,” no less. While the first four daughters remain unmoved by his tale of woe, Mabel (also Shannon Hartman) falls for him. When the pirates arrive on the scene, they decide to marry the daughters, until the major general (Jennifer Mischley) appears to spoil the plan. He squares off against the equally incompetent pirate king (Jason Quinn) and ultimately wins by claiming to be an orphan, thus pulling on the heartstrings of the pirates who are orphans themselves. Later, his grief over telling such a lie is appeased by the pirate-fighting police force (double cast with the pirates and the daughters in different scenes) Frederik has formed, until Ruth and the pirate king deliver some bad news to Frederik: He was born on Leap Day, and therefore, has not yet reached his 21st birthday and is still indentured to the pirates. The entire cast is a riot, from the goofy pirates to the sassy and sultry daughters. As Mabel, Hartman is sweet but determined, leading the police force in her Frederik’s absence, with a lovely soprano vocal. As Ruth, she is pretty much the opposite. Her required quick changes between the two are formidable – until the last scene where she appears as a Ruth-Mabel hybrid (“So are you Ruth or Mabel?” asks Frederik. “I honestly don’t know,” she replies). Jason Quinn as the pirate king and Jennifer Mischley as the major general are both goofily inept in their positions of authority, putting up a front of power while respectively doing a little jig and singing about being a pirate king or rocking a dixie cup-patterned romper. This Pirates is as much an experience as it is a show. While not for the stuffy, traditionalist theater-going crowd, it is truly one of a kind. Put aside your trepidations, keep an open mind and you will leave with a smile on your face.